Experience the upscale elegance of Grand Hyatt Washington. Centrally located in DC’s Penn Quarter, near popular local attractions including the Verizon Center, Smithsonian Institution museums and national monuments, the hotel provides a warm welcome and a modern, sophisticated experience. The hotel offers 897 luxury suites and rooms with beautiful city and atrium views. 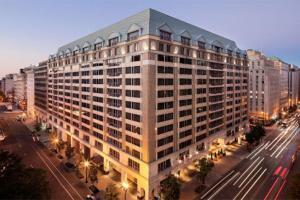 Located within walking distance of Verizon Center and the Washington Convention Center. Cure Bar & Bistro - Seafood and Steak; Cabinet - Breakfast. Washington Monument, Lincoln Memorial, City Center, National Mall, Verizon Center, Newseum, National Zoo, Kennedy Center.